ASL "aloittelija" kitti 3, TANKS! Tuote loppunut. Kysy saatavuus info@wanhaliitto.fi tai yhteydenottolomakkeella. Advanced Squad Leader starter kit on itsenäinen peli joka tutustuttaa ASL:n maailmaan hieman yksinkertaistetummilla säännöillä ja skenaarioilla. Starter Kit #3 esittelee tankit. 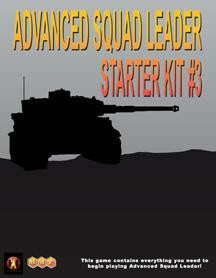 ASL Starter Kit #3 is a self-contained ASL module which will give players the opportunity to start playing Advanced Squad Leader almost immediately. A liberally-illustrated rulebook teaches gamers ASL using a conversational style to teach the concepts of ASL. If you own and play ASL Starter Kit #2 you will be pleasantly surprised to find how easy it is to spot the new rules in ASLSK#3 - we've highlighted the new rules so that you can skip rereading what you've learned in ASLSK#2 and get right to the new rules! What does ASLSK#3 add? TANKS! The famous and deadly German "Tiger". The reliable "Sherman". The tank which won the east - the T-34.